Hello and welcome to CoachTech. This project is something I’ve been planning for a while now, and I’m excited to launch the site. During my journey as an analyst in the game I love, I’ve been lucky to meet some great and unbelievably talented people. My goal is to use our collective knowledge to provide a hub where people can come to learn about how to best use modern technology to aid their coaching or the running of their club. There is no better example of this than the coach education courses, which will be available in the near future. Together, we have designed a curriculum which we feel will help aspiring analysts, coaches of all levels and even technical directors to better understand certain aspects of the professional game. Our course in opposition analysis will give insight into how game plans and opposition scouting reports are formulated, while our evidence-based coaching course is designed to help teach how some powerful insights into your team can be gained using basic techniques any coach can apply. For more information on the courses please visit here. One of the first things I did using our new Twitter account was ask coaches how they decide which session they deliver to their team. Thank you to everyone who shared this and voted. Below are the results. A fundamental part of my role in the professional game is to accept and work around the notion that our memory is often wrong. Multiple studies have proven that accurate recall of events in elite-level coaches (one of which involved Premier League managers) is between 30%-40%. Essentially the human brain ‘fills the gaps’ in our memory with assumptions and guesses causing us to feel confident in our recall of events despite this not to be true. The same issue occurs with eyewitness testimony in courts, and a whole host of other memory-based scenarios. This is the Misinformation Effect, and is worth researching for any aspiring coach. Looking at this in practice, based on the results above, 25% of the coaches who voted on our survey may be acting on ‘gut instinct’ with only 30%-40% accuracy in their memory, and this is the very reason I have a job in professional soccer. A further 11% of participants watched video first, which is of course a step in the right direction. There is no doubt value in a ‘coaches eye’ and any good analyst would never suggest that this isn’t the case. However, as coaches looking to get the absolute best from your players, delivering sessions designed to improve areas of weakness in players, can we do more? The rotation and periodization system will ensure that a coach covers every aspect of the game for their players, but may also lead to issues in recent weeks not being addressed as and when it starts to affect our teams and players’ performances. Using the example a coach who wants to teach his or her players to switch the point of attack, this subject may not be covered using a rotation system for another 3 or 4 weeks. However, over the last 5 games, there may have been multiple occasions where the opportunity to switch it has presented itself, but not taken and key learning opportunities missed due to rotation of sessions. A simple system of analysis is implementable for a coach at any level. In my journey so far I’ve found a challenge, which most analysts face, is that many coaches believe that analysis is too difficult, complex, expensive or time consuming to implement. This could not be further from the truth, and the reason I decided to build the course in evidence-based coaching mentioned above. As a coach, how much of your time and money spent on your education is focused on traditional ‘grass session’ courses (coaching badges)? There is no doubt huge value in this, but what good is a great session on defensive transition when your team and players have been crying out for a session on switching the play in recent weeks? 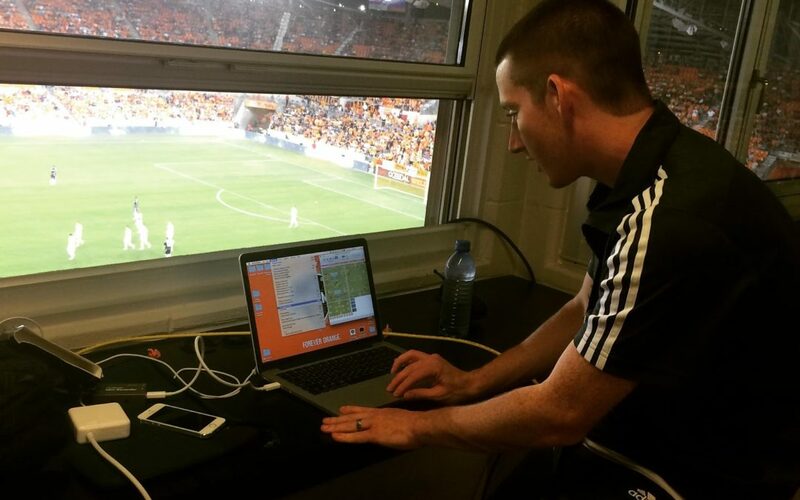 My job at Sheffield Wednesday, the University of Virginia and now Houston Dynamo has been to design a system of evaluation ensuring that the coaching staff know everything they need to about the team and our players, based on the evidence available. In doing so, they can make more informed coaching decisions. To do this, we use a combination of statistics, video and a wide range of other resources, which we are lucky to have available to us. I plan to use CoachTech to help share some of these practices via consultancy, coaching education courses and guest blogs from coaches and analysts. Thank you once again for visiting the site. I’m extremely excited to push forward with this project and hope that you will gain something from the services we plan to offer in the near future. Please feel free to get in touch with us if you have any questions. I’m interested please forward me the information. Thought your interview on modern soccer coach was great. Will definitely be following to learn more. We use the “gut” approach far too often despite having some data available. Would love to learn more about how to utilize that data more efficiently as right now so much of it is overload.